Before proceeding with the installation, be sure to stop all running MySQL server instances by using either the MySQL Manager Application (on OS X Server), the preference pane, or mysqladmin shutdown on the command line. 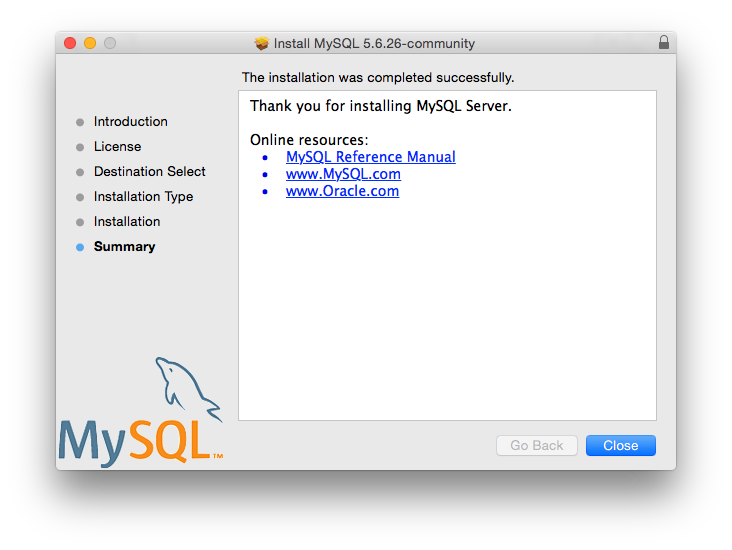 Double-click the MySQL installer package. It will be named according to the MySQL version and the OS X version you have chosen. 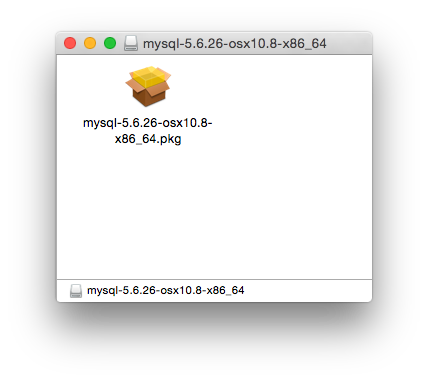 For example, if you have downloaded the package for MySQL 5.6.45 and OS X 10.8, double-click mysql-5.6.45-osx-10.8-x86_64.pkg. If you have downloaded the community version of MySQL, you will be shown a copy of the relevant GNU General Public License. Click Continue and then Agree to continue. Once the installation has been completed successfully, you will be shown an Install Succeeded message with a short summary. Now, Close the wizard and begin using the MySQL server. MySQL server is now installed, but it is not loaded (or started) by default. Use either launchctl from the command line, or start MySQL by clicking "Start" using the MySQL preference pane. 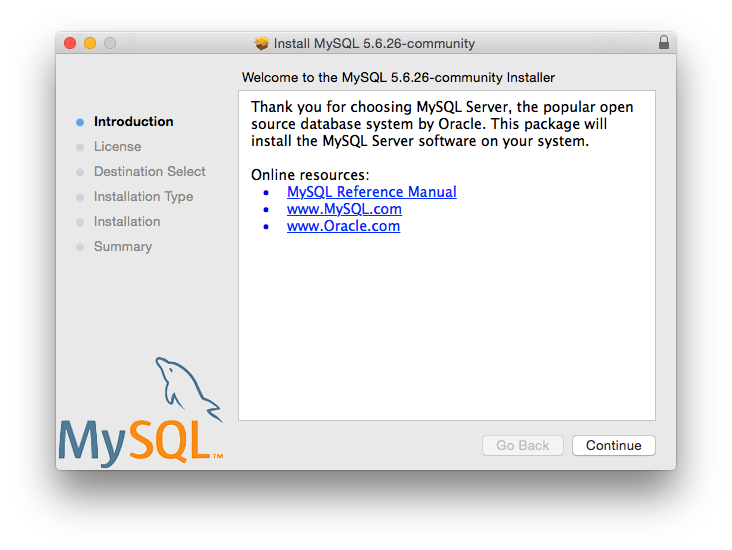 For additional information, see Section 2.4.3, “Installing a MySQL Launch Daemon”, and Section 2.4.4, “Installing and Using the MySQL Preference Pane”. 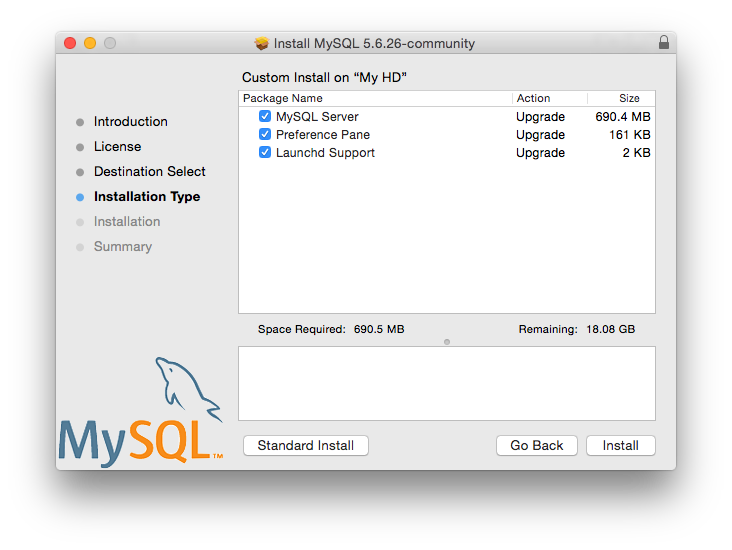 Use the MySQL Preference Pane or launchd to configure MySQL to automatically start at bootup. When installing using the package installer, the files are installed into a directory within /usr/local matching the name of the installation version and platform. 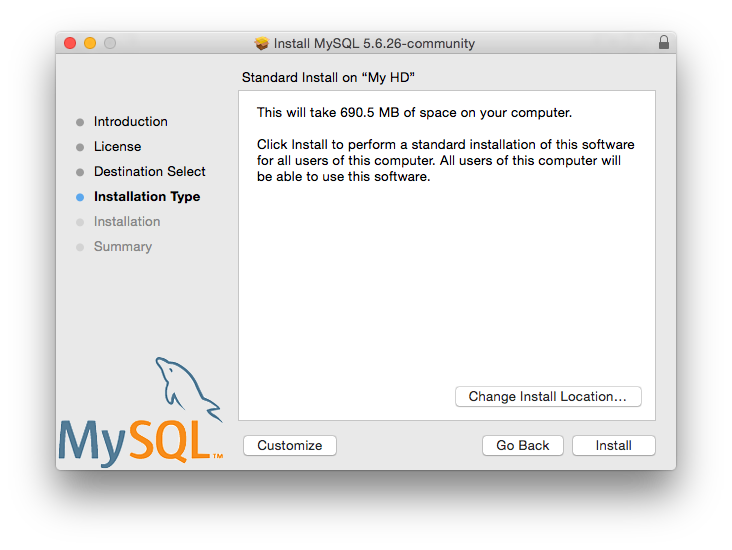 For example, the installer file mysql-5.6.45-osx10.8-x86_64.dmg installs MySQL into /usr/local/mysql-5.6.45-osx10.8-x86_64/ . The following table shows the layout of the installation directory.